In this example, you’ll learn to manage orphan records using the staging area. Step 1: View the staging area. – Import data to build your org chart. – On the View menu, find the Panel tools and select Staging Area. – Orphan records appear as a hierarchical list of names in the staging area. – Orphans that have missing or invalid manager data display at the highest level of the list. 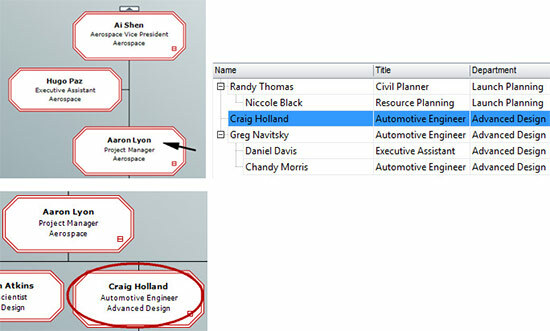 In the example above, Randy Thomas, Craig Holland, and Greg Navitsky have missing or invalid manager data. – Orphans that have valid manager data but are orphaned indirectly as a result of an error in their manager’s data appear in the list nested under their manager’s name. 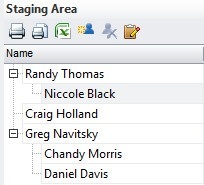 In the example above, Niccole Black is nested under her manager Randy Thomas and Chandy Morris and Daniel Davis are nested under their manager Greg Navitsky. Step 2: Display additional fields in the staging area. – The staging area’s default layout displays the name field for orphan records. To format the Staging Area to display additional fields, click the Modify Staging Area Settings button. – Select a field(s) to add to staging area display and click the Add button. – The additional fields added to the staging area can help better identify and, ultimately, place the orphan records. In the example below, the Title and Department fields have been added. Step 3: Print or export records from the staging area. Staging area records can be printed or exported to Excel and shared with managers or colleagues in order to assess next steps for correcting these records. – To print, click the Print button on the toolbar. To preview before printing, click the Print Preview button. – To send staging area data to Excel, click the Send to Excel button. Step 4: Assign orphan records to managers in the chart. – Click and drag a name from the list to a manager’s box in the chart. This action creates a box for the orphan record under the selected manager. – In the example above, Craig Holland is assigned to his manager, Aaron Lyon. – To move a branch of orphans from the staging area into the chart, drag and drop the manager who heads the branch. All of the associated orphan records in the branch will automatically move with the manager record. – In the example above, Greg Navitsky’s branch is moved to the chart by clicking and dragging Greg’s record from the staging area and dropping him on to his manager, Craig Holland. The OrgPlus staging area holds orphan records after your data import. Easily print or export the list or click and drag records from the list and drop them into the chart to assign them to their correct managers. Once records have been correctly assigned, return to your data source to update it with the changes you’ve made to your chart.